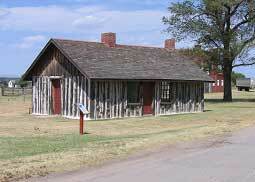 The ordnance sergeant’s quarters (1874) and the civilian employee quarters (1882) are rare examples of a once common frontier construction method of walls made of vertical logs. These are rare examples of a once-common frontier construction method. Vertical logs form the walls of these buildings. 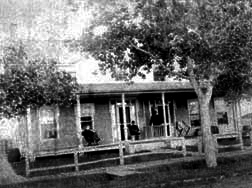 The 1878 commanding officer’s Quarters and the duplex 1882 officers’ quarters (figure 4) are the only frame houses left on “Officers’ Row.” The 1892 Guard House was the only brick building erected by the US Army at Fort Supply. It has been restored and furnished to 1893 and contains an exhibit area. A replica of the original 1868 stockade provides visitors with a glimpse of frontier army life. 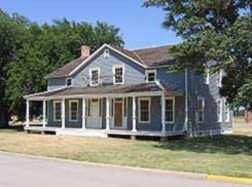 The commanding officer’s quarters (1879) and the duplex officers’ quarters (1882) are the only houses left on Officers’ Row. The guard house, built in 1892, was the only brick building erected by the army at Fort Supply. The restored and refurnished guard house contains an exhibit area featuring artifacts, photographs, and graphics.